Rising occurrence of hair loss disorders among adults owing to environmental causes and stressful lifestyles has propelled minoxidil market revenue globally, with the substance being added to numerous shampoo and hair growth products. Male pattern baldness (MPB) is considerable common in most regions and it is estimated that two-thirds of men in the U.S. have some level of noticeable hair loss by the time they are 35 years old. Supposedly, 25% of men suffering from MPB start experiencing the disorders before they reach the age of 21, indicating a broad target range for the minoxidil industry. The industry is also strengthened by the easy availability of products containing minoxidil for the consumers, with the rapid development of e-commerce platforms. Being an FDA-approved ingredient has resulted into an increased adoption by consumers, while growing awareness regarding its effectiveness has considerably driven the minoxidil market expansion. As reported by the Academy of Dermatology (AAD) in the U.S., alopecia areata is believed to be an autoimmune disease where a body attacks its own hair. Though there is no cure for the disorder, use of minoxidil products help in treating affected people to stimulate hair regrowth. With the increasing prevalence of alopecia areata predicted to affect nearly 147 million people in the U.S. over the coming years, the minoxidil market could potentially become a key ingredient segment within the healthcare industry. Continuous attempts to make more effective products will also push the market penetration, as the population rises exponentially and hereditary hair loss problems carry forward to the next generation. Keeping in line with consistent efforts to improve product performance, the FDA had recently approved 5% minoxidil for women’s formula in hair growth products, particularly in Rogaine. Earlier, only 2% minoxidil Rogaine formula was approved by the authority and dermatologists had to recommend using men’s Rogaine to women, which was already made up of 5% minoxidil concentration. The product contains a foam which women can use while styling hair and can witness fuller hair in about 12 weeks. Though the ingredient works only when being used, the performance of the product allows it to be preferred by people and will warrant a sustained revenue source for the minoxidil industry. 5% minoxidil concentration has been the prominent ingredient being consumed by the producers of hair loss treatment solutions, as it has a wider application scope and can give desirable results to most of the affected population. Citing another instance which propagated the significance of the minoxidil market, a study had revealed in 2017 that using 5% minoxidil along with FDA-approved iGrow Hair Growth System helps women suffering from female pattern hair loss growth hair faster. When compared to using each treatment separately, the combination of both led to the most appreciable and fastest results and also generated the highest level of self-reported satisfaction. Similar approach to hair loss treatment, finding an effective combination to help patients, will further create demand for 5% minoxidil and proliferate the global minoxidil industry. Increasing affordability of treatment solutions and the upsurge in disposable income worldwide will also foster the industry growth. In recent times, growing concerns about the use of harmful chemicals and substances in consumer products has caused manufacturers to obtain natural substances and oils to accompany their key ingredients. The trend will also have an impact on the minoxidil industry, supported by the favorable attitude of consumers towards green labelled products. Referring to an innovative discovery that can tremendously benefit the minoxidil market, researchers have recently found out remarkable uses of emu oil for various health related applications. Among these, it was observed that adding emu oil to 5% minoxidil showed incredible improvement in absorption and hair growth rates. The combination can lead to thicker and faster hair growth due to the presence of essential fatty acids and moisturizing properties in the oil. All in all, unending efforts by researchers to develop more potent hair loss treatments will substantially transform the minoxidil industry over the next few years. 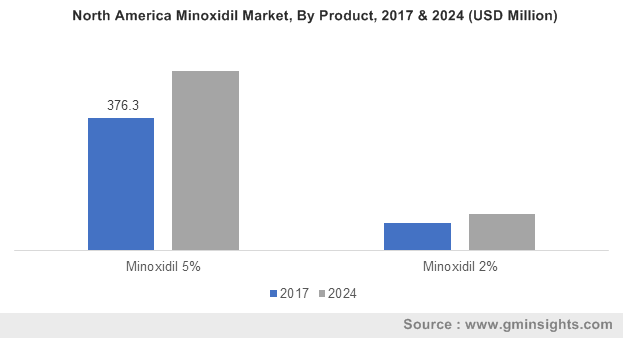 Comprising prominent suppliers of the ingredient, including companies like Renata Limited, Dr. R. Pfleger Chemical Factory GmbH, A McNeil PPC Inc., Nanz MED Science and Par Pharmaceuticals, the minoxidil market is anticipated to surpass USD 1.2 billion in terms of revenue by 2024.